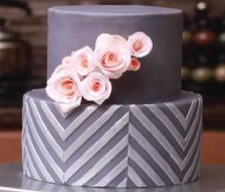 Wouldn’t it be great if you could easily produce a beautifully complex piped design and use it as a textured cake decoration? 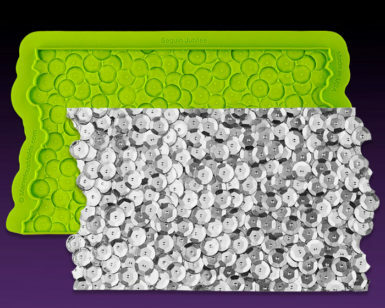 This is what we had in mind when we created the “Piped Perfection Simpress™” which can be used to effortlessly cover the sides of a cake in order to quickly create a sugar crafted masterpiece. Take a moment to inspect the intricate stringwork pattern captured in this unique Simpress™ mold. The interlocking and overlapping loops instantly convey a complexity that would be nearly impossible to achieve by hand. It is only through the magic of silicone and the clever design from our artists that could bring such an incredible textured panel into existence. Now cake decorators around the world can take this piped masterpiece and apply it to their favorite cakes, cookies and cupcakes.Whether it be a simple birthday cake or a grand wedding cake for hundreds, take advantage of this opportunity to embellish your decorated cakes with a texture reminiscent of piping techniques found only at the highest level cake competitions.